Income-based indicators of happiness have been shown to be limited in their ability to predict happiness. 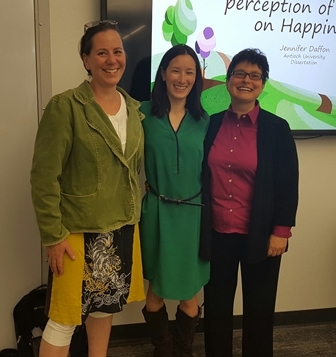 Alternative measures of happiness have been gaining prominence in happiness research, and two predictors of happiness were investigated in the current study. The extent to which happiness (measured by affect, life satisfaction, and psychological well-being) could be predicted by gender and perception of community safety was investigated with 19,644 participant responses to The Happiness Alliance Survey. Multiple linear regression models indicated that gender and community safety are significant predictors of affect, life satisfaction, and psychological well-being. The effect of the predictor variables was similar for all three of those happiness measures. B values indicated that both predictor variables had the greatest impact on psychological well-being and the least impact on life satisfaction. While all three models were statistically significant, they did not similarly predict the satisfaction with affect, life satisfaction, and psychological well-being scores. The results suggest that while gender and perceptions of community safety should be considered as part of the whole picture that supports a full life, there are likely other variables and life domains that have stronger influences on happiness. Daffon, Jennifer K., "The Effects of Gender and Perception of Community Safety on Happiness" (2017). Dissertations & Theses. 346.